"Cha-ching!" went the register as it opened. "2 dollars and seventy-two cents is your change, sir. I'll even give you the 50 cent piece I have, if you would like," said the cashier. "Well, isn't that somethin'? I haven't seen one of those in a while. I'll take it," the grandfatherly man said as he nodded his head. The young man handed him his change. "Would you like help out to the car with that, sir?" "No, thank you. My great-grandson here is well enough to help me. Have a blessed day!" "Thank you, sir. You too." The old man and the boy made their way out to the parking lot. After they were done loading the car, the man gave the 50 cent piece to the boy. "Wow Pop-pop! I don't think I've ever seen one of these before." He took the coin and flipped it in the air. "Oh, those? They have been made for as long as I can remember. We don't use them very much anymore, but when I get a chance to, I do," the old man said as they got into the car. "They remind me of the day I met your great-grandmother." "Really? What does a coin have to do with Mee-mee?" "Well," Pop-pop began, "I was just 16 years old. I grew up during what we now call The Great Depression. Money was real tight back then and we all worked hard to keep food on the table. "In our family, once a week, we kids could take our money and use it how we liked. I remember I had worked hard all day in the field, picking strawberries. I had earned a whole 50 cents! That was a lot of money back then. I wasn't sure where I wanted to go, either to the general store, or to get somethin' to eat at the diner down the road. I decided to let my newly earned coin help me decided where to go. Heads for the store, tails for the diner. 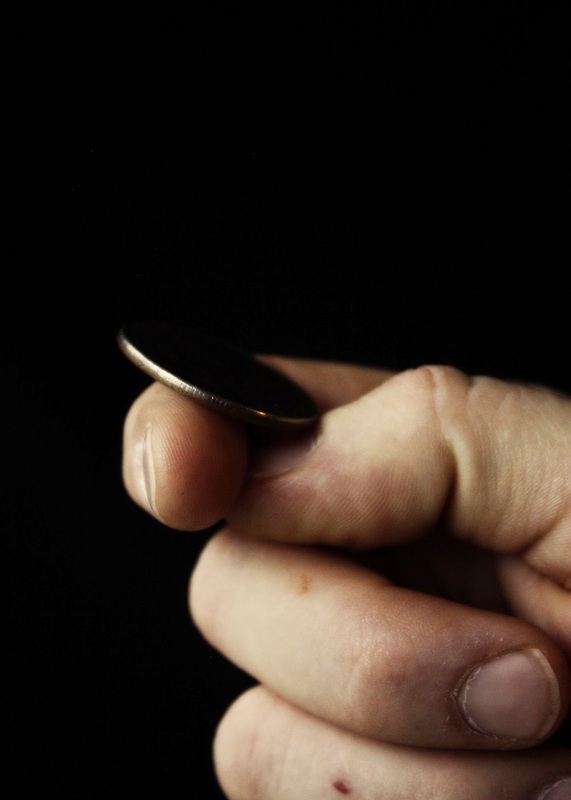 "As the coin flipped through the air, I heard a girl's voice call out 'Heads!' I snatched the coin out of the air and slapped onto the back of my hand. We looked at each other, and then at my hands. As I lifted my hand up to reveal what was underneath, it was heads! She had a big grin on her face.
" 'Hi, I'm Harry. You must be new around here,' I said as I introduced myself. "I will never forget that day I met your Mee-mee." Harry said as they drove down the road toward home. I love this. Very realistic. Wish there was more lol.